Notts Tree Surgeons are reliable local Arborists that specialise in all forms of Tree Care services. Click here to call Notts Trees. We are your local tree maintenance experts. 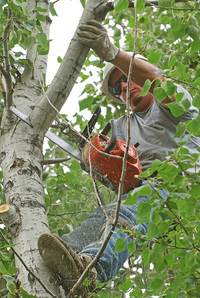 We offer a highly comprehensive, competitively priced service, covering the entire area of Tree Management. At Nottingham Tree Services, we deliver a highly professional and complete tree care service to residents of the Nottingham, Derby and surrounding areas, providing solutions for the full range of needs such as removal, cutting, crown reduction, trimming and all activities using the very latest techniques and equipment, delivered by our highly professional and dedicated team. For specific Services, click on the relevant Tab below the Services Tab. If the Service that you're after isn't on our list please contact us and we'll be more Happy to provide it! Give our tree experts a call today on 0115 824 9899 or just complete the form on the right and we will be happy to call you back to arrange a site visit when we can give you a free quote for any work you may require.